Newcastle looked to have all three points in the bag when Isaac Hayden's strike had put them ahead midway through the second half, but Bolly, who looked to have fouled Dubraka before scoring, restored parity at the death. 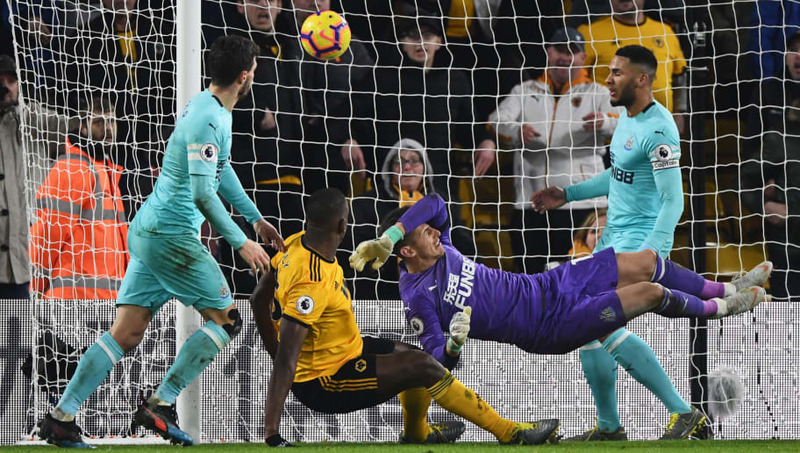 The first half saw few efforts on goal, but Wolves could have gone ahead were it not for a smart save by Martin Dubravka, who did well to react quickly and deny Jimenez following the striker's powerfully driven shot. The Magpies could have taken the lead with the last action of the first half, though Connor Coady did well to get a touch to deflect Salomon Rondon's strike away from goal. ​Newcastle grabbed the lead against the run of play on 56 minutes, Isaac Hayden's strike creeping past the left hand of Rui Patricio, who should have done more to keep the ball out of the net. The Magpies were on the verge of taking three points back to Tyneside before Boly's controversial equaliser meant that honours ended even in what was a thoroughly absorbing encounter. As a result, it looked like they were going to be frustrated by the visitors, but Bolly's intervention spared Wolves' blushes in a scramble that will cause much debate after the goal was given despite Dubravka appearing to be impeded by several Wolves players. 90+4' GOAL! Willy Bolly right at the death snatches a point for the hosts. Molineux errupts! It may seem a strange decision to name a forward as ​Wolves' best player in a match that required a defender to score, but Jimenez looked the most likely to strike for the hosts, although they were toothless in attack for much of the second half. Rui Patricio did not cover himself in glory with the concession of Newcastle's goal. Look away Rui Patricio...#NUFC have the lead as Hayden fires through the Wolves stopper. The Portuguese international looked like he was anticipating Hayden's strike to go towards the far post, but was caught out when he couldn't get enough of his left glove behind the ball. Newcastle's next fixture sees them welcome Huddersfield to St. James' Park in the ​Premier League on Saturday, 23 February, with kick-off at 15:00 GMT.